Last month we welcomed with relief a team of marine biologists from the Khaled bin Sultan Living Oceans Foundation. These scientists had agreed to visit our resort and assist us in our battle against the growing population of Crown of Thorns starfish that we were finding on our reef. 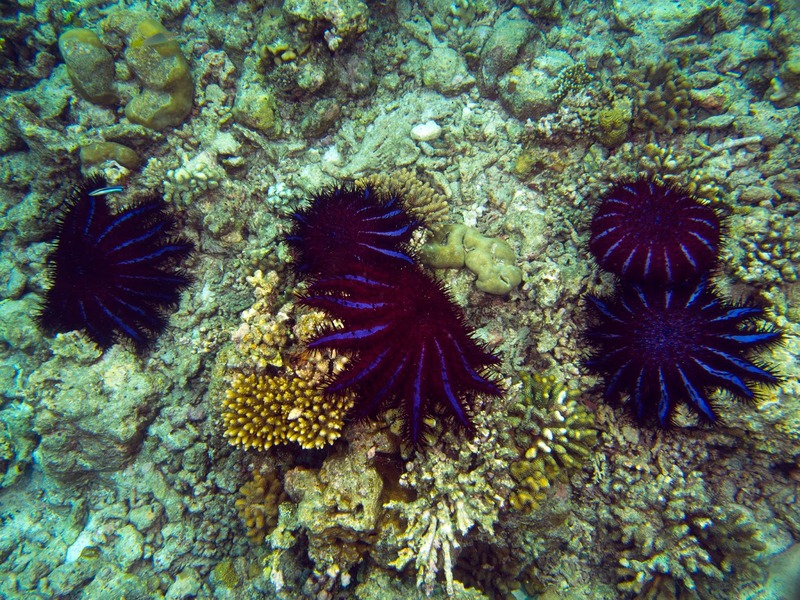 Crown of Thorns starfish (Acanthaster planci), or 'COTS', are coral eating animals that naturally occur on Indo-Pacific reefs. In small numbers they actually play an important role on the reef- by feeding on the faster growing coral species they allow room for slower growing corals to flourish. However, for reasons which are not always apparent, there will sometimes be huge outbreaks of the starfish, hundreds or even thousands on a reef, which can cause irreversible damage to the corals they are feeding on. On the Great Barrier Reef in Australia, where there have been several outbreaks of the voracious species, coral cover has declined by more than 50% over the last 30 years (AIMS study) and the Crown of Thorns starfish are thought to be one of the biggest contributors to this loss. Bright purple with about 20 arms, this beautiful sea star has poisonous spines and shouldn't be touched. In one dive, we brought up nearly 100 COTS! With these sorts of statistics in mind and a COTS outbreak on our hands, we were very pleased to welcome the team of 4 for both the expertise and manpower that they would bring. Lead by Andy Bruckner, an experienced coral biologist from the USA, the team are working on behalf of the Khaled bin Sultan Living Oceans Foundation as part of a Starfish Control and Removal (SCAR) programme. They target areas which have been hit by COTS outbreak with the goals to 1) combat the outbreak, minimizing the damage as much as possible, 2) train people to safely control outbreaks, 3) collect data in order to create a global database on COTS occurrence and outbreaks. 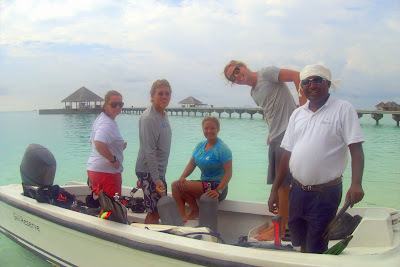 Over the course of four days, where three dives were carried out each day, the group managed to remove 974 COTS from the reef connecting Gili Lankanfushi with the neighbouring island of Himmafushi, which stretches only as long as 3km! Even though we were aware we had a lot, 974 was substantially more than we had expected and it just showed how this assistance had come at a very vital time. A few COTS still remain, and for now it is up to Debs and myself to remove what is left of the outbreak.